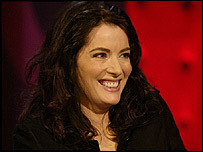 The latest recipe collection from chef Nigella Lawson has been shortlisted for the BBC's new book club. Feast: Food That Celebrates Life is one of 24 books which will be discussed on Page Turners, a new BBC One series presented by Jeremy Vine. Among the novelists shortlisted for the series are Ian Rankin, Kazuo Ishiguro and Anita Shreve. The BBC is hoping the series will be as successful as Channel 4's Richard and Judy Book Club. The shortlist for the club was whittled down to 24 books from an original shortlist of 300, by a panel of judges that included authors Fay Weldon and Marian Keyes, as well as TV presenter Claudia Winkleman. "It's a wonderful thing to see reading being promoted and even better to see the emphasis being put on books which make you want to keep turning the page," Keyes said. Each of the programmes will explore three of the selected titles and a celebrity advocate or author will then discuss the book with Vine. "I am delighted that Page Turners has attracted such high-profile names from across the publishing and media industry," said Alison Sharman, controller of BBC daytime programmes. "It indicates the real buzz that the show is already generating." Several little-known writers are also on the shortlist, including author Marina Lewycka with her debut novel A Short History of Tractors in Ukranian. David Nicholls, whose debut novel Starter for Ten received a huge sales boost after it was featured on Richard and Judy's Book Club, is also featured on the list with his latest book, The Understudy. The series is due to begin in the spring, with book retailers and libraries promoting the shortlist from March. Some of Britain's 15,000 book clubs will also take part.